60+ PMP PDU Online Course Bundle | Renew Your PMP® Now! PMI approved renewal process – complete these four self-­paced certification courses worth 60+ PMP PDU to renew your PMP certification. Hassle-­free – each course is online, self-­paced and available from any location. Just log on and learn at any time. Super simple – get the bundle, take the courses, submit your PDUs and renew your certificate. Click ‘Add To Cart’ below to start renewing your PMP certification before it’s too late. Don’t leave it too late to renew your Project Management Professional certification. You worked hard to get your PMP certification, so you won’t want to risk losing it by missing out on your next renewal. And because you need to renew your certificate with the PMI every 3 years, we’ve created this course bundle to help you do that, in one easy to access resource. When you complete Master of Project Academy’s PMP Certification Renewal Bundle, you’ll have earned the 60 PDUs (Professional Development Units) you need to renew that all-­important certificate. And if you miss out on renewal, or just renew too late, you may have to earn an extra 60 PDUs annually for the next two years, just to catch up. But with this course bundle you don’t have to worry – just complete each of these four online courses worth a total of 60 PDUs, and simply renew your certificate with the PMI. When you take these courses you’ll also be reinforcing key PM concepts, learning new best practices and becoming a more rounded Project Management Professional (and more attractive to future employers). What are the 4 courses in your Certification Renewal Bundle? I was not expecting such a through process to renew my PMP. I could access the courses that helped me to earn PDUs in 24 hours. After I submitted my PDUs, PMI approved in a day. Great comfort! Master of Project Academy is the leading online, self-­‐paced course provider for project management professionals. So far we’ve helped over 50,000 professionals across 180 countries with our courses, and our students boast a 99.6% certification exam success rate. As well as our popular online courses, we also produce helpful and informative content to aid project management professionals’ development. Check out our post on how to renew your certificate. *Full refunds may only be claimed where no more than 10% of the overall bundle course progress has been completed. Ready to earn your PDUs and ensure your Project Management Professional certificate status? Click ‘Add To Cart’ below and grab your course bundle with a 90% discount off the price of these 4 courses if bought individually. Once you complete each course in the bundle you’ll be ready to claim your 60 PDUs and renew your PMP certificate. Why should I renew my PMP? PMI requires Project Management Professionals who hold PMP certification to show professional experience or event activity that will help them keep pace with changing project management trends. That’s why PMI expects each PMP certification holder to submit 60 PMP PDUs every three years to retain their PMP certification. This is called a CCRS (Continuing Certification Requirements System) cycle. Since PMP certification is a globally reputable certification in project management world, it is strongly recommended that you retain your PMP certification. When should I start submitting PMP PDU to renew my PMP certification? As soon as you earn your PMP certification, submit any events or activity in CCRS that earn PMP PDU hours. Many certification holders wait until too close to their PMP expiration date, and try to complete all their required PMP PDU hours in just a couple of months or even weeks! PMI is rigorous for these PMP certification holders and your PDU submissions may not be accepted – so we advise against leaving it until your final month before renewal. How can I submit my earned PMP PDUs? Once you complete a course, you can submit your earned PMP PDUs in the online CCRS system of PMI. Check out our PMI PDU Submission post to see how it works. What should I do after I complete 60 PMP PDU Hours ? After you complete 60 PDUs in your CCRS cycle, you must apply for PMP renewal in your PMI profile page. Just fill out the application form to abide to the PMI code of ethics during PMP renewal process. You’ll then be directed to a secure payment page to pay your PMP renewal fee to PMI. How much does PMP certification renewal cost? PMI members pay $60 USD, while non-members pay $150 USD to renew their PMP certification after completing their required 60 PMP PDUs. You can pay this fee online directly to the PMI using a card to complete your renewal process. Can I fulfill my PMP PDU hour needs for free? There are free courses or free events (e.g. webinars, conferences etc.) that you can attend and gain PMP PDUs. However, completing all 60 PMP PDUs for FREE will be tough especially if you are a working professional. Therefore, the best way to complete PMP PDUs is enrolling in online courses and gaining PDUs easily. 60 PMP PDU Online Course Bundle will be a perfect fit for you to complete your PDU needs in one go! Where can I find more information about PMP Renewal? Check out our PMP Certification Renewal post to learn more about the PMP renewal process, and how to earn and submit your 60 PMP PDU hours. If you need fewer than 60 PDUs to renew your PMP certification, you may want to check out our other PMP PDU bundles: 45 PDU Bundle, 30 PDU Bundle, or 15 PDU Bundle. Get 90% Off Your PMP Certification Renewal Bundle Today! Great opportunity to fulfill 60 PDU hours to retain PMP certification! Very useful! Easy way to complete 60 PDUs . Thanks Master of Project for this! Courses are great and definitely deserves the value. Maybe, enrollment process can be simplified. I was looking for a convenient way to fulfill my 60 PDUs. I am ready to renew my PMP now. Thanks Master of Project Academy for this bundle. Great training bundle to fulfill PDU requirements. Thanks for this bundle to contributors. I could fulfill my PDU gaps. Very good opportunity to fulfill PDUs. I was struggling to find PDUs. Thanks for the bundle! Very much recommended. Good source of several PDU hours. It is a great opportunity to have this bundle. I was looking for webinars and earning 1 PDUs by watching them. Now, I could complete all my PDU needs in one go! It is a great value for great price! Thanks. 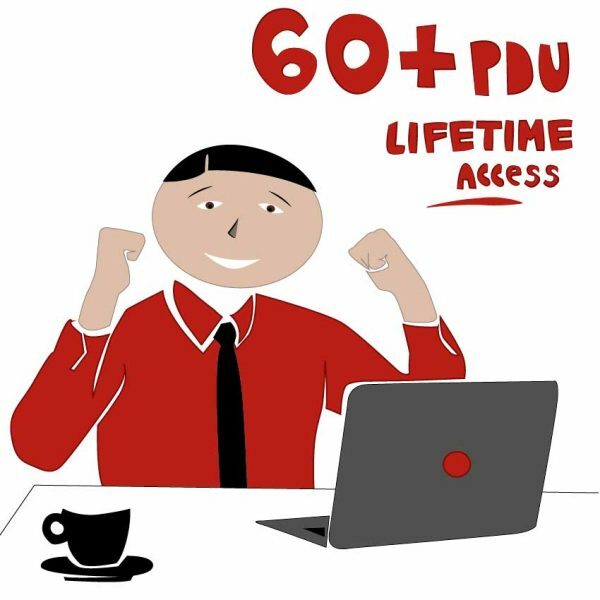 Great resource to complete 60 PDUs. I was looking for 1 PDU webinars and it was taking long time. This one was straight! Thanks. It is great to enroll in this 60 PDU courses and fulfill all CCRS cycle requirements. Courses are also great and I learned a lot! I liked the content very well. Instructors are very responsive. One more improvement can be having these practice questions as simulation instead of PDF. I enrolled in this bundle and I could completed the courses in one month. I am now complete in the CCRS cycle and apply for PMP renewal! Thanks Master of Project Academy. I was in the last 3 months of renewing my PMP period. I was looking for earning PDUs desperately on the web and fortunately I came across with this package. Thanks a lot to Master of Project Academy for the 60 PDU PMP Bundle. It helped me to complete my CCRS cycle online and self-paced. It was great to come across with this 60 PDU bundle. I could go ahead through the courses and fulfill my CCRS cycle in one go. Easy & affordable. Thanks to Master of Project Academy for offering this bundle. It is easy and affordable. Great bundle and easiness to complete CCRS cycle. I earned 60 PDUs for the next 3 years. Easy, online & straight-forward. No hassles. Great option to renew my PMP. It is great to have this PDU bundle when it comes to renewing PMP certificate. Because, it is always an hassle to find PDU resources. Only flaw of this site is, it takes about 24 hours to enroll in the courses after purchase. But this is acceptable. Finding PDUs to renew PMP is a hassle. With this pack, I could renew my PMP certification easily. Thanks to Master of Project Academy! I was struggling to find PDUs. I could completed my PDU needs and renewed my PMP certification with this course. Great offer & bundle. Great, easy and affordable way of earning PDUs. PMI accepted my reported PDUs right away. Only improvement area can be, after I purchased, team took one day to enroll me in the course. But it was not an hassle at all! I was struggling to find PDUs to renew my PMP. Only 6 months left to renew my PMP. I came this bundle. After I completed, I could renew my PMP. Only improve can be enrolling in courses right after purchase. However, team is very responsive and thanks to Emily from support team for her dedicated support. Great PDU credits course for renewing my PMP certification. I could enroll in courses all online and completed my CCRS with ease. Only improvement can be, after I purchased, I had to wait around 8 hours for my profile to be activated and seeing the courses. I was looking for online PDU webinars and I came across with this PDU bundle. It is hassle free. I just enrolled and completed my 60 PDU CCRS cycle in a month. PMI already approved and I am now good to renew my PMP. Thanks! Very well PDU breakdown. I could easily complete my PDU training in 2 weeks and PMI accepted my submissions already! Very through and convenient way! great flexibility and affordable way of earning PDUs. How fast! After submitting my PDUs, PMI approved it very shortly. Great convenient! Great PDU resource. Only improvement area can be enrolling in the courses right after purchase. I was enrolled after 15 hour. But it worths for sure! Perfect PDU breakdown. I could easily complete my PDU training and PMI accepted my submissions in two days! Very pleased! Great lectures, instructors were also great! Perfect resource for PDUs with very good PDU breakdown. Suggested! Great courses and great PDU breakdown! I earned my PDUs easily and PMI accepted my reported PDUs very quickly. Thanks to MOPA! Very satisfied with PDU distribution as well as the course structure of the courses. Recommended! The package was very good package to satisfy my need of 60 PDUs. Also, customer relations team was very responsive, each time I contact them they answered within 24 hours. Thanks to Master of Project Academy it was very enjoyable and easy to receive my remaining PDUs. High value with great price. Recommended to everyone who is seeking for an opportunity to renew their PMP Certification by receiving 60 PDUs. I had been looking for an opportunity to renew my PMP certification for so long. I feel myself very lucky that I hit Master of Project Academy during my search. I found exactly what I was looking for. I was very satisfied with the course content and structure as well as customer relations. Thanks to Master of Project Academy for this great 60 PDU Bundle package. Great opportunity for great price! Thank you for this well planned 60 PDU Bundle. Thank you for all of your good work. I was satisfied with this great 60 PDU Bundle package. Suggested. Everything was great! I suggest this 60 PDU Bundle package for everyone who wants to renew their PMP Certification. Thank you to Master of Project Academy team! I highly recommend this course! Thanks for that well-planned package. Finished three days ago! I was looking to find PDUs for renewing my certification. Very satisfied to get it. I have passed PMP exam with a good score. Great course, very clear and practical. Thanks. Awesome course. Instructor is very knowledgeable and made the content easy to learn. Very comprehensive course, it has been going well. Thanks. Very comprehensive course and it has been going very well. Thanks. The course has really helped with preparation if you are thinking to purchase, I happily recommend it! This is a well-presented course. Easy to follow and very clear. I have completed recently. The content was very informative and clear. This is an easy and affordable way to get into Project Management. 15+ PDU Online Course Package. Contains four online and self-paced certification courses to renew your PMP certification. 30+ PDU Online Course Package. Contains four online and self-paced certification courses to renew your PMP certification. 45+ PDU Online Course Package. Contains four online and self-paced certification courses to renew your PMP certification.